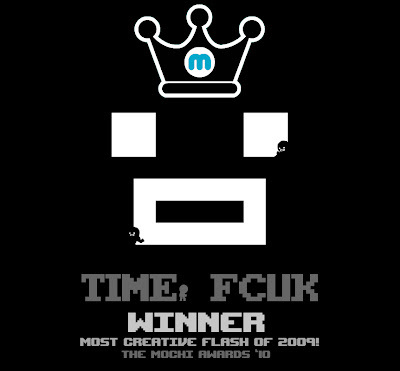 Earlier today Time Fcuk took home a Mochi for "Most Creative flash game of 2010". I wasn't able to attend the show but asked Tyler to pick up the award (thanks Tyler). There were no acceptance speeches and not having had William or I there i feel the need to write something so ill do so now. I made TF with William and Justin at a transitional part of my life where i realized that i could either be content with where i was in life and settle or attempt to push myself as far as i could taking bigger risks financially and artistically because i feel that even if i lose, the fight will have been worth it in the end either way. I love doing what i do, and i love that others also get to enjoy the outcome. I love the friends ive made and things ive learned through this artistic medium. (I44W7-F7DZ4-VJWRC) Video games have not only given me a voice and semi financial stability but also a much needed creative outlet so i don't become that guy you see on the street having a loud argument with something that isnt there. Im honored to accept this award and even more so honored for getting to work with William and Justin on this game, i think its one of my best and i think it will spawn many future creations! Congrats, dude, TimeFck deserved it. One question: is there any chance for a downloadable version, like you did with Triachnid, Spewer, a boy made of meat, Aether etc? Way to go man, keep up the good work and congratulations.